Clone NH3 recognises human Filamentous actin (F-actin) and reportedly also recognizes Globular actin (G-actin). The antibody binds to the N-terminal region of actin, but not to the extreme N-terminal 40 amino acids. In tissue sections the antibody stains the cytoplasm of macrophages strongly, and gives granular, localised nuclear staining of all cell types. As this is a mouse IgM antibody, an anti-mouse IgM secondary antibody must be used to detect this primary. Human monocytes and U397 cell line. This antibody is reported to recognise actin in the filamentous form with the epitope likely to be located between residues 120 and 226 of the molecule. Purified IgM prepared from tissue culture supernatant. Our Abpromise guarantee covers the use of ab205 in the following tested applications. WB 1/100 - 1/500. Detects a band of approximately 43 kDa. As this is a mouse IgM antibody, an anti-mouse IgM secondary antibody must be used to detect this primary. Immunocytochemistry/ Immunofluorescence - Anti-F-actin antibody [NH3] (ab205)Image from Ibrahim, Ahmed S. et al. Oncotarget 7.8 (2016): 8532–8545. doi: 10.18632/oncotarget.7384, Fig 6D. Immunocytochemistry/ Immunofluorescence analysis of ARPE cells labelling F-actin with ab205. Cells were fixed in 4% paraformaldehyde for 10 min, washed with PBS, and blocked for one hour. Cells were then incubated for 3h at 37°C with Anti-F-actin antibody [NH3] (ab205) at 1/200 dilution. Thereafter, cells were washed 3 times with PBS containing 0.3% Triton-X, incubated with secondary antibody and coverslipped with Fluoroshield containing DAPI as a counter stain. 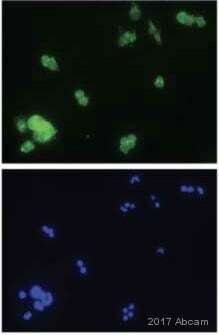 Immunofluorescent signals were detected by confocal microscopy. Immunohistochemistry (Resin sections) - Anti-F-actin antibody [NH3] (ab205)This image is courtesy of an anonymous abreview. Immunohistochemistry (Resin sections) analysis of mouse bone tissue cells labeling F-actin with ab205 at 1/200 dilution. Mouse tibia bone samples were fixed in neutral buffered formalin for 72 hours at room temperature, embedded undecalcified in plastic and sectioned at 5 microns. 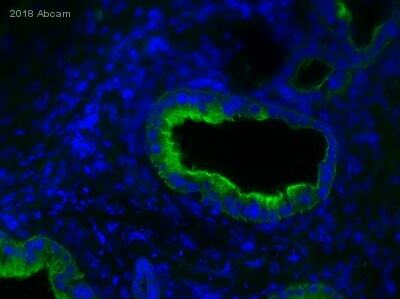 A polyclonal goat anti-mouse Alexa Fluor® 488 secondary antibody was used at 1/700 dilution. The image shows a 1 micron thick z-projection of the chondrocytes in the proximal tibia growth plate. 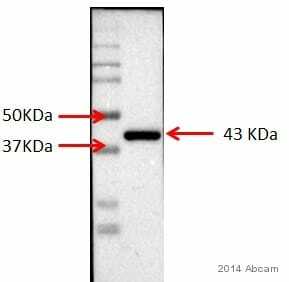 Western blot - Anti-F-actin antibody [NH3] (ab205)This image is courtesy of an anonymous abreview. Incubation with primary antibody for 15 hours at 4°C in 5%milk+ PBS+0.1% Tween 20. 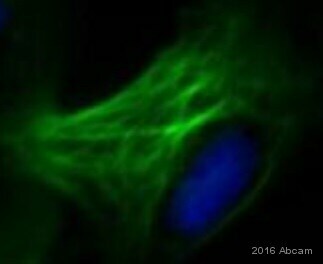 Immunocytochemistry/ Immunofluorescence - Anti-F-actin antibody [NH3] (ab205)This image is courtesy of an anonymous abreview. Immunocytochemistry/ Immunofluorescence analysis of mouse cortical neurons labeling F-actin with ab205 at 1/100 dilution. The cells were fixed with Ethanol and permeabilized with 0.2% Triton X-100. 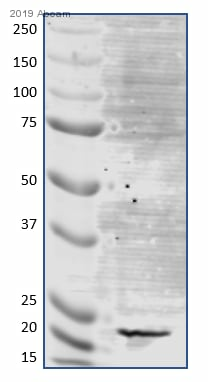 A polyclonal goat anti-mouse Cy3 conjugated secondary antibody was used at 1/200 dilution. Immunohistochemistry (Frozen sections) - Anti-F-actin antibody [NH3] (ab205)Image courtesy of an Abreview submitted by Jamie Richards. ab205 staining F-actin in rat brain tissue by Immunohistochemistry (frozen sections). Tissue was fixed with paraformaldehyde and then blocked with 2% BSA for 1 hour followed by incubation with the primary antibody at a 1/25 dilution for 24 hours. A biotin-conjugated goat anti-mouse IgM was used as secondary antibody at a 1/400 dilution. No permeabilisation step was used. Je suis à la recherche d’un anticorps spécifique de l’actine F et un autre spécifique de l’actine monomérique ou actin-G.
J’aimerais un anticorps déjà testé en Immunofluorescence et pas de toxine type phalloidin. 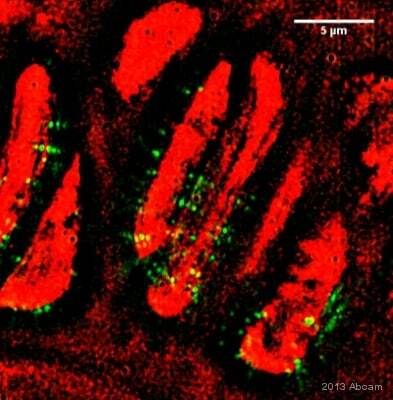 Je peux vous proposer ab205, Anti-F-actin antibody [NH3] qui est un monoclonal de souris garanti de fonctionner en immunofluorescence. Cependant, nous n’avons pas testé le taux de toxine dans ce produit et donc nous ne pouvons pas garantir qu’il n’y a pas de toxine type phalloidin présent. Malheureusement, nous n’avons pas d’anticorps anti-G-actine. Tous nos autres anticorps reconnaissent les deux formes F et G.
"I have tried, according to your suggestion, to do the IHC experiment again with a different secondary antibody "Alexa Fluor® 488 Goat Anti-Mouse IgG, IgM (H+L)" that recognize both IgG and IgM. This didn't recognize the F-actin antibody and resulted in no positive-specific staining. At this point I think I have tried almost every step in the attempts to get a positive signal." I am sorry to hear the suggestions made have not improved the results on this occasion. I appreciate the time you have spent on these experiments and would be pleased to arrange a free of charge replacement or refund in compensation. If you decide to get a free of charge replacement we would recommend it would be beneficial to include a positive control, such as gastrointestinal tissue or brain tissue in the following experiments. I look forward hearing from you with details of how you would like to proceed. 1.The secondary antibody that we are using recognize all of the isotope of the mouse heavy chains. i attached to the original IHC compliment form the positive control which was a mouse anti mouse antibody against PCNA ( https://www.abcam.com/PCNA-antibody-PC10-Proliferation-Marker-ab29.pdf ). the secondary antibody recognized it so surely i can say that it recognize the isotope. 2.Although it is not a part of a standard staining protocol in frozen sections, i performed an heat-induced epitope retrieval according to your suggestion as follows: the sections were heated (microwave) in 0.01M sodium citrate for 15 minutes total. Full power until reaching boiling point and then 20% form the maximum power for the remaining time. looking forward to receiving your reply"
Thank you for taking the time to provide additional information and to include our suggestions in your experiments. I appreciate the time that was spent doing additional experiments. I am sorry to hear that the results obtained are still not satisfactory. Reviewing the details you have kindly provided gave us more insight in this case. I can confirm that the Isotype of the Anti-F-actin antibody [NH3] (ab205) is an IgM. The secondary antibody listed on the form provided as far as I can see detects all isotypes of IgG. For that reason it will work with the Anti-PCNA antibody [PC10] - Proliferation Marker (ab29) that was mentioned. However I would regrettably not expect it to detect the ab205 - IgM. Could you confirm that this was the secondary antibody that was used? I would suggest repeating the experiment with a secondary antibody that detects IgM. If still no satisfactory results are obtained please do not hesitate to contact us again and I am pleased to provide a replacement. While more information were provided in the previous email the Anti-Cytokeratin 5 antibody [2C2] (ab128190) was mentioned. Could you please confirm if there are problems with this antibody? If so we would be pleased to investigate this case further for you. 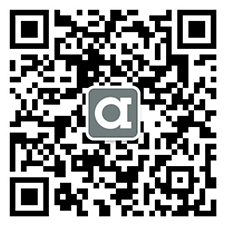 Could you please provide information about the experiment with the Anti-Cytokeratin 5 antibody [2C2] (ab128190) and the results by filling in a new questionnaire? That will help us to investigate the case for our quality control. We appreciate the time spent on this and hope that we can be of help. I look forward hearing from you with the requested details. I hope we can resolve the case.